Actually, Scott, most of the reviews I’ve read or watch suggest that the fittings on the Triumph are superb, and that the ride is probably the better of the two. Given that it barks back the bikes my friends road when I was a yoof there’s an emotional attachment two. That said, they’re both beautiful and neither could possibly be a mistake. That said, I’ll have another look at the BMW options. Edit: Looked again. There's no way I'm gong straight onto a 1200cc bike (and doubt I ever will), and I don't like them as much anyway. The BMW is an acquired taste - the engine is my favourite power delivery for a non-sports bike. Most Triumphs I’ve seen have cheap parts, such as the bolts, levers, circlips etc. Not an issue if the bike is keep in a garage and dried off after rides, but ours has suffered from the elements. I’m sure the cheaper bikes you had originally looked at would have faired no better though in comparison. The BMW would come with better suspension, span adjustable levers, and better finishing kit as standard. That pushes the RRP up a fair bit though, and all those things can be changed fairly easily - it’s just the time/hassle. I like the older look. If money was no object I’d be buying a Norton before looking at the Triumph - but probably 2.5 - 3 times the price for a similar age modern bike. The Triumph is a heavier bike, probably a good 30+ kilos more than the Ducati. The Ducati is too softly suspended for a lot of riders, and maybe a few of the fatter jurnos in testing ;) But, it has upside down from forks, and a single rear shocker - so any adjustments/update should be more beneficial. Triumph are a little cheeky as their blurb about their bikes is still dry weights, with no fluids anywhere and I believe without the battery. The Ducati does look a lot more modern, as that the styling they have gone for. The Triumph is a hark back to the good ole days, and they have done it well, albeit there isn’t too much that modern about the twin bikes, accept thankfully the electronics! Fair enough if you don’t like the styling of the BMW. There’s not much that will convince you if you don’t get a certain excitement just looking at the bike. You are being daft though when you say 1200cc is too big to start with. Some of the metrics have been quoted to you before, but exactly why is 1200cc too much/too big? Taken on its own the cc ignores the BHP and torque figures, which will ultimately determine the rideability. I won’t reiterate my point about one litre sports bikes, but consider something like the Harley Iron 1200 or Sportster: 1200cc bike with roughly 60BHP. Lower seat height than anything else on your list (an early prerequisite until you sat on a DAS bike) and less powerful than the 650cc DAS bikes you’ll be learning on. The point I’m making is don’t get hung up on numbers per se, otherwise you’ll end up with a narrow list of bikes you’re just looking for validation for from a watch forum. A single-make forum might actually provide some insight into either a Triumph or Scrambler as a first bike after DAS, if you’ve managed to be so rigid in your requirements before actually sitting on either. Better to keep an open mind, although I accept you won’t be persuaded of the merits of the R9T. Last edited by Snoodles; 16th August 2018 at 05:41. One of the greatest bikes ever made. +1 went pillion on the back of dad on one of these, good times. Well, my theory test is now booked for 5/9, which annoyingly was the earliest date I could book; and I've subscribed to the online learning zone to get plenty of revision and practice in (I really don't want to fail the hazard test - the multiple choice questions seem pretty easy). I've also booked four consecutive days with the training school, commencing on 18/9. At the moment, the intention is to do three days training, and then take MOD1 on the fourth day. Tomorrow I have a free day, so I'm off to the Triumph dealer in Hemel Hempstead to have a close up look at the Street Twin, and have a sit on it properly. Hopefully I can do similarly with regard to the Scrambler next week. On average, how much does a bike seat lower by once you sit on it? Can you adjust the suspension to lower it a bit as well? When you sit on the bike and it goes down this is called Sag in suspension parlance . Road bike normally sag 20 mm at the rear and 25 mm the front. Thats on a well set up road bike. If you sit on something like a Ktm Crosser sag will be about 100 mm. As also stated above this is what the frame is doing , squishy seats all add to lowering. You can lower it by reducing pre load, trouble is if you do this too much, then the suspension feels very crashy and can bottom out. You can lower a bike by dropping the fork yolk through the forks, eg shortening the forks. But this has to be done carefully as it sharpens up and quickens the steering, eg tank slappers! Why do I know this, cos Im a short arse and like big bikes! Classic case. Best tip given to me by Tony Archer ( seat builder over Huddersfield way) is when taking foam out of a seat to reduce height, maintain the curvature of the seat. If the seat goes too flat eg just a seat pan, then your thighs get splayed more thus shortening your overall leg length. Thats why bikes with narrow seats afford lowest feel. Last edited by higham5; 16th August 2018 at 20:49. 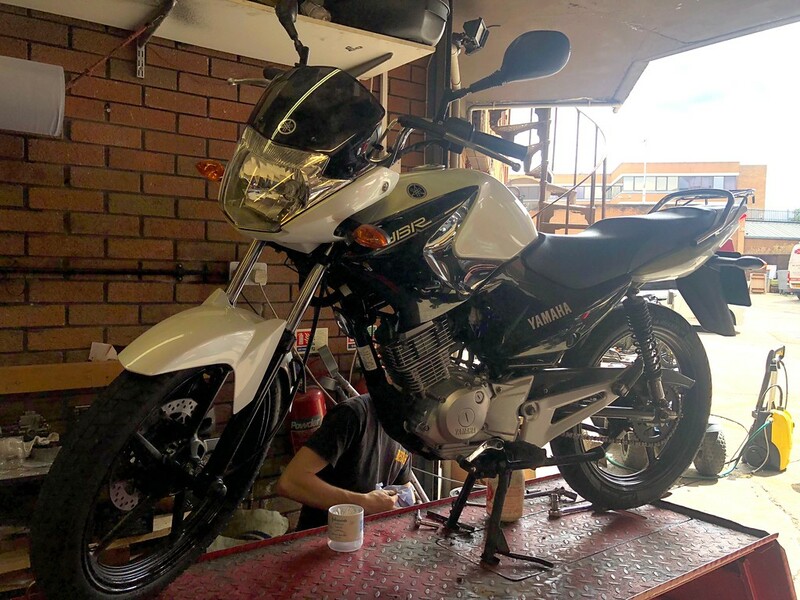 I did my learning and test on a Yamaha XJ6 and was not a big fan – it just wasn't comfortable enough. Then I got hands on the the riding school's MT-07, and I loved it. However, it was a tad too rowdy at the lower end, and it just didn't feel like the best choice for me as my first big bike. I passed my test and bought a CB500F, and it was a fun, reliable, and safe bike the year I had it – really a great first bike. Then the time came for a change, and I seriously considered the CB500X. It's a really cool, very comfortable, reliable, and fun bike. But something else had caught my eye – the CMX500 Rebel. As soon as I laid eyes on it I just knew that I wanted to try it, and as soon as I did I knew I had to have it. I've had mine for just over a month, and it's a fantastic bike. Supremely comfortable, which I didn't think it would be, surprisingly fun and nimble, and a great bike for the price and engine size. It puts a smile on my face every day, and I can't recommend it enough. Yeah, there are more exciting, powerful, cooler bikes, but the Rebel shouldn't be ignore if that's the style and riding style you think you're after. Funnily enough, both the CB500R and CMX500 are on my longer shortlist. I’m still going to try to get in them for a test ride, and appreciate your feedback. Well, I made a decision last night. Given that I have about a month before my training and test on one of the school's 650's, I'm going to buy one of these things today to get some practice in between now and then. They're reasonably cheap, and have good reviews too. I'll just make sure I agree the basis of a buy-back with the dealer so it'll hopefully be like renting a bike for the month. I think it makes sense, and it will hopefully boost my chances of passing considerably. Last edited by learningtofly; 17th August 2018 at 08:56. My thinking too, Steve - it's only about 5 miles from me and I should be able to pick it up for about a grand. All being well I'll be down there in a couple of hours to sort it out. If you buy the Bullit just make sure you do your pre ride checks thoroughly and check everything for tightness. Chinese bike manufacturing isn't at the same level as Japanese! I'm pretty sure I'll be buying the Yamaha, Duncan. I only want it for a month, and unless my son wants to buy it from me afterwards I want an easy sale back to the dealer (or privately, if push comes to shove). They seem to be pretty well regarded. Success! A couple of years old, 6000 miles on the clock, FDSH, just serviced and pristine! Should be picking it up at 5ish. Brilliant! Now you just need to go and ride the wheels off it. perfect learner bike, very well regarded and will sell very quickly when you have had your use. Looks in great condition too! Use your time wisely. Find out whats good about the bike and what you like, and just as importantly, whats not good and what you dont like. Real life experiences will be valuable when you come to choose your next ride. As previous folk have said, dont discount a bike you may like because of its engine size, bigger doesnt always mean faster and more powerful. Also I get that being able to put both feet flat on the ground is an advantage, but dont say no to a bike if you can only sort of put one foot down with the bike slightly leaning. Not ideal but its a small sacrifice to pay to get what may be a much better bike overall, you will soon get used to it anyways. When are you booked in to Wheelie School? Don't understand - it's to practice on prior to taking my test in a month, after which I'm selling it back to the dealer. Precisely. Therefore, not having these electronic aids is good. Tony its not a criticism, it the list of things that bikes get bunged on them these days which de sentisize the owner from the real world. Just like ABS on a car. On some of the soooper top end bikes they need wheelie control, abs mid corner , electronic suspension adjustment ESA . That would be Sergeant Phil Esterhaus in the Hill Street Blues who used to finish each tam briefing with the words "Hey! Lets Be Careful Out There" Great Series. A great choice! Did my CBT on a YBR and liked it so much that I bought one the next weekend. It was a fantastic and suprisingly fun commuter bike for the 7 months between my CBT and final big bike test, and I sold it with little loss in about 3 days. It's a great learner bike, and yours look fantastic! Just a quick update on this, but since I bought the YBR to practice on I've been hit quite hard by man-flu so have been resting up a bit. That said, I've still managed about 60 miles on it which, bearing in mind I'm deliberately riding in traffic rather than the open road, isn't too bad. I'm certainly much, much more confident than when I first sat on it (driving away from the dealer my heart was pumping away like mad! ), and now I want to focus a bit on slow driving and manoeuvres, U-turns, lifesaver, etc as I know I'm going to be doing a lot of that when my training on the 650 starts. I'm also trying to get some daily practice in on my theory, both multiple choice and hazard perception, as I'll be furious with myself if I fail that when I take it in a couple of weeks. I've also further refined my bike options, albeit that I'll probably test a few before buying. I'm still dead keen on the Street Twin - far more so than the Scrambler, so it's the clear favourite in terms of naked retro. However, I'm also still really drawn to the MT-07 as the other main option - a bit sportier, a bit more power despite the slightly smaller engine (750 compared to 900, but much higher bhp), and rave reviews time and time again. I think they're all good choices as a first large bike, and I'll definitely be seeking to test all three of them properly as soon as I have my test out of the way. Last edited by learningtofly; 22nd August 2018 at 16:18. OP...do your best to learn how to ride a bike with NO aids. Sure they can save your bacon at times, and some of them are nice to have, but there is NO substitute for your own riding ability and skill. If you have to RELY on rider aids, you've got the wrong bike. Do you apply this philosophy to the Cars you buy as well? Saftey and electronic aids are fantatsic. But they are there to save your arse in an emergency, not to use as a crutch. There is NO electronic substitute for poor rider/driver skills. If you have to RELY on aids, you have a problem, and you need to develop your skill set. ABS on a bike is a fantastic addition. Traction control on a normal 600 or 700cc bike is a nonsense. Clearly, if you can't manage a bike of that capacity without TC, then you're 'over biked' and need to cut your teeth on something sensible that is less likely to hurt you. Last edited by Tifa; 22nd August 2018 at 15:29. I shall be happy to take your enlightened advice once you can show me how fast you react when you go through an unseen diesel spill. Keep your mind open on the Scrambler. I much preferred it to your other options after a test. The MT is a great bike and gets rave reviews but it’s a different ride and for me not in a good way. Yes, I’ll be testing the three for sure. I’ll try to keep an open mind as best I can! You seriously think TC will save you? And what happens when you hit that diesel spill on a bike without it? That's when riding ability counts. I'm not anti rider aid per se, they have their place. But in a crisis they're no substitute throttle control and riding ability. Great, so what car do you drive then, Caterham, TVR? What happens to you without it was my question so no need to send it back to me. You claimed TC was not needed on lower powered bikes, I gave you an example where it might save your bacon. Otherwise you’d have to be Marc Marques to have a slim chance to react fast enough to keep it on its wheels. Re diesel, its usually shed on roundabouts by buses or hgv’s that have overfilled. If you hit a fresh patch when leaning over no aids gonna save you because 9 times out of 10 the front wheel will wash out. By the time it bites again its too late anyways. Re traction control and abs, both useful no matter what the size or power of the bike, especially when there may be gravel on the road, or you need to brake sharpish in the wet. Other aids are also useful imo. My S1000RR has a quickshifter for example. I know racers use these, but tbh I love it just riding round normally. Also cornering abs, useful for someone with way more ability than me, but if I ever have to brake hard unexpectedly on a corner it could poss be a lifesaver. Nothing to do with me not being experienced but as we all know, sh!t happens when least expected. Hahahaaaa...owned a Chimera for 2 years! Looking back I'm suprised I'm still here. Great car, but way too quirky for everyday use. I've been continuing my research and review watching over the last week, and have had something of a revelation in terms of the short shortlist for testing. Somehow, I thought that the final choice would be down to the Triumph Sreet Twin and the Ducati Scrambler; however, I seem not to have noticed the very obvious third contender (especially bearing in mind my life-long Triumph love)... the Triumph Street Scrambler. I have been reading this thread with massive interest. That street scrambler looks lovely. This has all got me thinking that I might need to look at my current watch to bike ratio... bikes currently at zero! I look forward to reading more and seeing where it takes you. One thing that I need to consider is the pillion, my wife won’t get on anything that doesn’t have something to stop her coming of the back and pretty much insists on a sissy bar type thing... not sure if that’s a consideration for most? I know I could just leave her at home but I’ve been there and done that and want something that can accommodate both of us without too much fettling as I don’t like the look of them when riding alone. I’m quite liking the look of the new Triumph Bonneville Speedmaster but haven’t done any real research. Good luck with your quest... exciting times. Last edited by learningtofly; 28th August 2018 at 08:45. If you are looking for naked retro Tony I sat on a Moto Guzzi V9 roamer at the weekend and it is one gorgeous bike. I recently bought a 40 year old Suzuki GS 550 to get back into riding but next year the MG is mine. What a bike! I do have the V7 as a potential test ride, actually, as mentioned earlier in the thread. The MGs are lovely looking things for sure - I'll pop over and have a look at the V9 now, though. Edit: Actually, it's the V7 III Stone that's the most likely candidate for me. Quite light, a relatively low saddle and very understated. The only thing I'll need to look at properly is whether the confoguarion of the V-twin engine makes it wider than I want... it certainly looks beautiful, though. Last edited by learningtofly; 28th August 2018 at 12:16. I do have the V7 as a potential test ride, actually. The MGs are lovely looking things for sure - I'll pop over and have a look at the V9 now, though. I had a look at the V7 as well, a much chunkier, heavier bike. I’d suggest the V9 would be an easier ride. Last years colours could be had at a very good discount too.